My daughter's blessing dress. This is handmade with love by my mother in law. I am impressed on how beautifully she made this crochet dress. 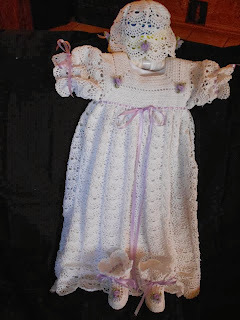 She is very good at crochet and have done many outfits like this for her grandchildren. This is a keepsake and a souvenir that my daughter will forever cherish. Imagine the time my mother in law spent on working this dress is truly remarkable. Hi, Nice blog I had a great time reading it. Would you please consider adding an intro to my website on your next post? Please email me back. Thanks!